Georgetown is a small Texas community, north of Austin, noted for its Victorian homes. The oldest university in Texas, Southwestern University, was built here in 1840. And, baseball legend Nolan Ryan hails from this town, too. The area was once the biggest cotton producer in Texas, and in recent years celebrates a Red Poppy Festival every Spring. The Georgetown Municipal Airport sits on 640-acres, north of the downtown area, and was built in 1943, as a U.S. Navy Auxiliary field. Lands adjacent to the airport include some scrub forest, but also lots of residential subdivision. To minimize noise impact, there is an informal ‘Fly Friendly Program’ which encourages local pattern traffic to remain north and east of the runways. Operations are managed by a Federal Contract Tower, open daily from 7:00 AM until 10:00 pm. FAA’s ATADS data shows this is a relatively slow airport, at 60K-70K ops per year, half of which is local pattern traffic. 3-23-2013 — FAA cuts coming to Georgetown airport. The article announces FAA’s list, as released on 3/22/13. Includes a range of opinions, running from much greater risks to ‘no big deal’. 3-7-2013 — GTU Airport Master Record. The operations count is substantially different from the ATADS data. 2-14-2013 — GTU advisory board abolished. Short webpost by Ben Sclair at GANews. 2-12-2013 — Abolishment of Airport Advisory Board at GTU. The City Council voted to abolish the seven-member board, sending that work to be handled by the larger transportation board within the city government. Video shows many pilots and airport tenants advocating for continuation of the Advisory Board. 9-21-2012 — Study looks for ways to turn around Georgetown airport’s declining revenues. The airport is seeing declines in fuel revenues, and may face a loss by 2014. The article mentions the impact of the opening of a new airport, Austin Executive, at Pflugerville. 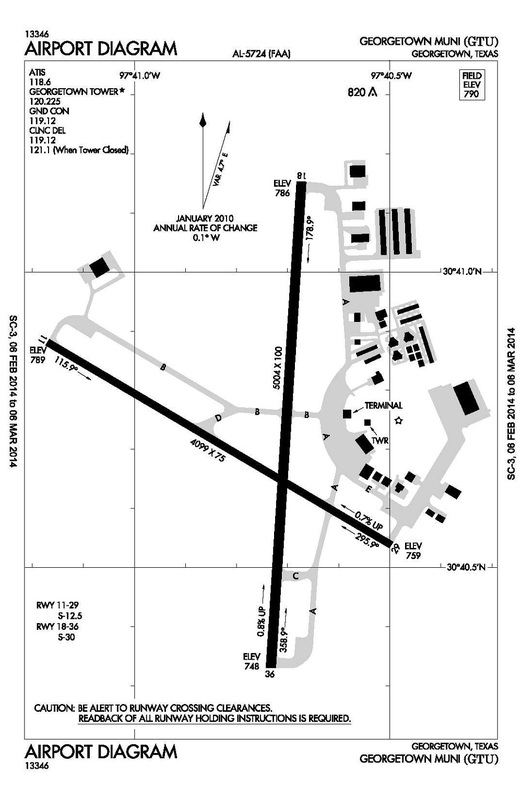 7-26-2005 — Airport Master Plan. It appears that Georgetown avoided federal grant obligations by funding their own Airport Master Plan without using AIP funds. This webpage has numerous links to elements of the Master Plan.